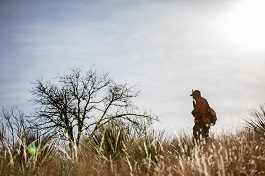 PHOENIX — Arizona hunters have one more weekend to get out in the field and chase the state’s three main species of quail — Gambel’s, scaled and Mearns’. The season ends Sunday, Feb. 10. The general bag limit is 15 quail per day in the aggregate, of which no more than eight may be Mearns’ quail. The general possession limit is 45 quail in the aggregate, of which no more than 15 Gambel’s, scaled or California quail in the aggregate may be taken in any one day. The 45-quail possession limit may include 24 Mearns’ quail, of which no more than eight may be taken in any one day. A valid Arizona hunting or combination license is required for all hunters 10 and older. All youth hunters 10 to 17 can purchase a youth combination license for only $5. Those hunters under 10 must be accompanied by an adult who possesses a valid hunting or combination license. Licenses can be purchased online at https://www.azgfd.com/license/, or from license dealers statewide. All hunters play an important role in conservation. Wildlife and Sport Fish Restoration Program (WSFR) funds are comprised of excise taxes collected on the sale of hunting and fishing equipment (including 11 percent on ammunition), the benefit of which comes right back to Arizona for habitat improvements, shooting ranges, boating access and more. Before heading out, watch this short AZGFD video showing two methods biologist Johnathan O’Dell uses to clean Gambel’s quail. For more information about hunting quail in Arizona, visit https://www.azgfd.com/hunting/species/smallgame/quail/.